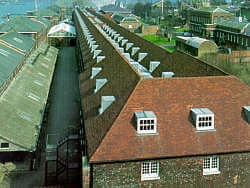 The Historic Dockyard Chatham has made rope since 1618. At over 1,100 feet long the Ropery is a unique and vibrant 19th Century working Ropery. As the last remaining original naval ropeyard in operation The Historic Dockyard Chatham still plays an important part in the production of both natural and synthetic rope. The Ropery represents one of Britain’s finest examples of 18th Century integrated manufacturing buildings. Visitors, businesses and film crews alike continue to purchase our rope for commercial and personal use. 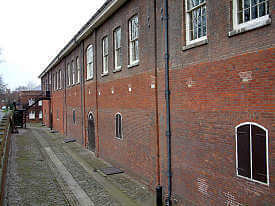 During the Napoleonic Wars the main ropery building, the Double Ropehouse was built. Spinning, closing and laying processes took place here and are still mechanised using the same equipment from 1811. The Double Ropehouse along with the Hemp Houses and Hatchelling House forms part of the ‘double ropery’ as it combines laying rope on the ground and also spinning on the upper two floors of the Ropery. During the ‘ Age of Sail’ hemp was the main raw material of ropemaking. In 1729 Hemp Houses were built to store the vast amount of hemp required to sustain the production of rope. Many of the buildings retain their original features including the early timber paneling. Built in 1786 the Hatchelling House is situated at the north end of the Double Ropehouse and was used by the Ropeyard’s hatchellers to straighten the hemp fibres before spinning. The first stage of the ropemaking process was undertaken by hand until 1864 when mechanised spinning machines were introduced. Women workers were employed to look after the new machines. The Yarn Houses are formed from three buildings now joined together, they were built in 1786 and are Scheduled Ancient Monuments and Grade II listed Buildings. The White Yarn House was used to store newly spun hemp yarns, a Tarring House where the yarn was dipped in molten yarn for rot proofing and the Black Yarn House where the tarred yarn was dried prior to being returned to the Double Ropehouse to be formed into strand.